Explore Bosch electric tankless water heaters from Tronic, including small models from 3000 series designed for point-of-use service, and large models from 5000 and 6000 series, built for the whole-house water heating. 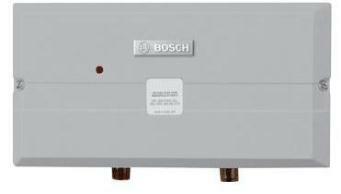 Bosch electric tankless water heaters sold in North America are known as Tronic and are designed for heating potable water on demand in both residential and commercial applications. The Tronic series is recommended for homes and areas where electricity is the only solution, preferred energy source and where a continuous supply of hot water is the desired option. Due to its tankless design and powerful heating elements they can be a great solution if planning to replace a big tank-type heater. Electric tankless water heaters are not as expensive as the gas type, and when comparing to the electric tank-type, tankless comes with the comparable price. They usually require an updated electrical panel due to the higher Amps (older houses). Due to the small, compact and lightweight design, electric tankless is the favorable option in places that are lacking in space, such as apartments, cottages, garages, workshops and small offices. The best spots for Tronic installation are inside the cabinets or under the sinks of the kitchens and baths. There are several indoor models available from Bosch Tronic, all grouped in 3000, 5000C and 6000C series. Bosch electric tankless water heaters from Tronic 6000C series are available in two sizes; WH17 and WH27, which are almost identical units, where larger WH27 model provides more hot water making it ideal for larger homes or multiple fixtures. According to Bosch, the Tronic 6000C is designed for heating potable water, and should not use the preheated water; or used outside, for recirculation applications, if the incoming water is above 86 F or where freezing might occur. Water is heated on demand while incoming water is going through two-heater modules. With the temperature rise of 45 F, WH27 can provide approximately 3.5 gallons of hot water per minute, while WH17, less - 2.3 GPM. Also, the WH27 model needs a higher water flow rate for the heater's activation, 0.8 GPM vs. 0.6 GPM of the WH17. 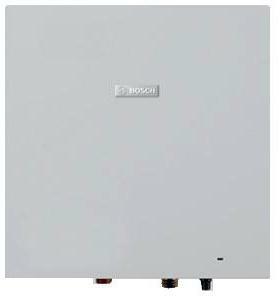 Tronic 5000C offers only one model - WH36, which is also the largest of all electric tankless water heaters from Bosch. WH36 is designed to work with three heating modules offering the power of 36 kW and water flow rate of up to 5.4 GPM, so it is recommended for the households that have high demand for hot water. Two of the most powerful models - WH36 and WH27, can be used not only in warmer regions but colder as well, while the smallest model WH17, with the power of 17 kW is recommended for southern warmer regions mainly, where the incoming water is not as cold. All the models can work on 220 V and 208 V, while WH36 can use 240 V. With the reduced voltage comes reduced power output. Also, due to the difference in the voltage and amps requirements (80 A vs. 120 A), it is needed to use different size of the breakers. All the models are designed as the whole-house tankless water heaters delivering hot water on demand and in continuous supply to homes with one to three fixtures. To provide a constant hot water temperature, which is leading to better comfort and user experience, they use the thermostatic modulation so that the unit can adjust its power based on the water flow and desired output. The temperature dial is conveniently located on the front cover of the unit, and it allows an easy and accurate temperature control between 95 F and 131 F. The set temperature can be seen on the LED display, which is also used for monitoring of the heating process. The advanced design includes the pulse-modulating elements resulting in the improved control and efficiency, and due to the reduced scale build-up, the performance is maximized. The electronic control PCB monitors the water flow rate and incoming water temperature all the time, and based on the set temperature; it utilizes the required number of heating elements. The power modulation is what provides stable temperature and better comfort. The thermal efficiency is for all models high - 97%, so most of the power goes toward water heating while only the small amount of energy is wasted. Thanks to the standard ¾” water connections, the units can easily deal with the high water flow and hot water tank replacement. Bosch electric tankless water heaters from Tronic 3000 series are point-of-use (POU) heaters that are smaller than the upper Tronic 5000C/6000C group of whole-house heaters and can be used for both residential and commercial applications. There are five models to choose from, offering power outputs from as low as 3 kW to the maximum of 12 kW and delivering the flow rate from 0.5 GPM to 1.8 GPM – making them ideal for under-sink or point-of-service applications. The Tronic 3000 uses the tube-shape heating elements made of copper, which heats water instantaneously and transfer the energy directly to the water with the minimal energy loss, resulting in the high energy efficiency of 99%. The heat exchanger is protected from the excessive water temperature which is over 194 F, and it uses the thermal cut-out that needs to be manually reset if it trips. Due to the simple design and use of electricity, they barely require any maintenance. The small unit size of maximum 12” x 6” x 3" allows Tronic 3000 to occupy minimal indoor space, making it perfect for hard to reach locations and tight spots. The Tronic 3000 is installed by hanging it on the wall either vertically or horizontally, except the model US12. The US12 model is also the largest model in this series – it comes with the highest power and water flow rate, as mentioned. The specs of all electric water heaters are shown in the table, but keep in mind that models can work with the lower voltage, which also reduces the output. The Tronic US3 is the only model that operates at 110-120 Volts. All the models are utilizing the mechanical temperature control, while US12 thermostatic - the unit will switch the elements ON and OFF and maintain the constant temperature of the outgoing water. The Tronic US12 uses the adjustment spindle (behind the nameplate) for the temperature adjustments. Other water heaters use the Power Selector Screw to set the power to Low (when one heating element operates) or Hi (both heating elements are ON). Bosch electric tankless water heaters are ideal for homes, garages, small offices, apartments, cottages, and places where it is hard to get hot water from the main water heater, and distant fixtures. The Tronic series eliminates the need for long piping, venting, and water storage; it minimizes sediment build up inside the heater and energy loss, therefore, saving you time and money. These are indoor units and must not be installed in rooms where there is a chance of freezing. Buy any of the reviewed Bosch electric and tankless water heaters, and you will get high performance and efficiency, enhance convenience and comfort, reliable and long-term heating, easy installation and almost no maintenance and unexpected costs. And what do you think about Bosch?